Anyone can die. These kids, they will have the courage to live. La Muerte is a supporting character in The Book of Life. She first entered the plot of the film when she and her husband Xibalba made a bet concerning which of the mortals, Manolo Sanchez or Joaquín Mondragon would marry Maria Posada. Despite being as old and ancient as time itself, La Muerte retains her vision of youth and radiant beauty. She is made entirely of white sugar candy with knee-length black licorice hair and multi-colored glowing eyes that are in shades of gold and red. She wears a red dress decorated with cempasuchil (Mexican marigold flowers) all over her dress and marigold flowers with lit white wax candles at the hem of her dress. She also wears an extremely large, wide-brimmed sombrero bedecked with more lit candles and marigolds (her favorite flower), small skulls, pink-plumed, curly, swirly feathers and palm leaves. She also wears a circular gold locket on a choker. La Muerte is a kind, truthful, sweet & generous goddess whose belief in the goodness and pureness of mortal-kind stems from her own heart, as well as from that of the departed and deceased mortal people who are now her citizens and subjects. She cares for everyone and anyone, no matter who they are, and will assist anyone who is need of her help, believing humankind to be completely pure. While La Muerte is very forgiving towards those who truly want to repent, she is also well known for her weakness for wagers. The only known bad side to her is when someone (i.e. Xibalba) cheats in wagers and bets, making her angry despite her sweet disposition. La Muerte and her husband, Xibalba, have been estranged for over a thousand years. Due to having a previous bet, in which Xibalba cheated, she rules the Land of the Remembered, while he rules the bleak Land of the Forgotten. Upon arriving at San Angel together to observe The Day of the Dead festivites, La Muerte remarks that Xibalba's heart has become as dark and cold as the land he now rules. The two have different ways of valuing human beings, as showed when La Muerte stops Xibalba from 'taking' an old man's life. When Xibalba begs for her to trade lands with him, LaMuerte playfully teases and scolds Xibalba reminding him that he is down there by his own doing. She also says that he "is not the man [she] fell in love with all those centuries ago." Hoping to distract his wife and make a play for the Land of the Living, Xibalba suggests they make another wager. La Muerte is enraged at first, but accepts the idea of a betting game. This leads them to finding Manolo, Joaquin, and Maria playing together. This leads to La Muerte choosing Manolo as her champion and blessing him to always have a good and pure heart. As part of the bet, La Muerte makes her husband promise not to interfere with the affairs of man should he lose the wager. Xibalba agrees and the wager is set. La Muerte reappears on the day Maria returns to town at the bullfighting arena where she slaps Xibalba for staring at Maria and cheers for Manolo when he appears in the arena. She appears after the fight when Manolo sings and Maria hears his anguished song, observing that the mortal girl was moved by Manolo's words. La Muerte appears again, when Manolo serenades Maria on her balcony. She is not seen again until Manolo, along with his mother and grandfather, reach the Land of the Forgotten to tell her that Xibalba cheated in their wager. Upon learning of this, La Muerte roars in anger. Xibalba appears, thinking his wife wishes to see him and reconcile. Instead he sees Manolo and his relatives along with his infuriated wife. Learning about Xibalba's whole scheme involving the two-headed snake staff, and the Medal of Everlasting Life, La Muerte, along with Carmen and Manolo, demand Xibalba assist in bringing Manolo back to life. When he refuses, La Muerte tries to persuade him by calling him "Balby", but when he still refuses she becomes angered until Manolo suggests the alternative of his own bet. Offering up the right to give the Land of the Forgotten to her husband, La Muerte convinces Xibalba to give Manolo a fair chance. La Muerte watches as Manolo meets his worst fear in the bull arena, and is happy to see him emerge victorious, as is the Candle Maker, and, to some extent, Xibalba. The three of them then give Manolo his life back. Later, the three of them use their powers on The Day of the Dead to bring Manolo's deceased family back to help defend the town. After the town is saved and the Medal returned, La Muerte and Xibalba reconcile on the top of the church. Back in the present day, the tour guide Mary Beth finishes her story and then leads the detention children back out to their bus. Waving goodbye, and saying one of the names of the youngest girl the guide reveals herself to have been La Muerte the entire time with the intention of teaching those children something about living and life. La Muerte can travel disappearing and reappearing in nearby places, leaving a trail of flower petals. She can also transform in many forms such as Mary Beth and an old woman. She has telekinesis as she is able to pull Xibalba closer without actually touching him. And at one point, managed to retrieve the rest of Luis Sánchez's body with only a snap of her fingers. She can generate and control fire. In tandem with Xibalba and The Candlemaker, La Muerte can restore the dead back to life. 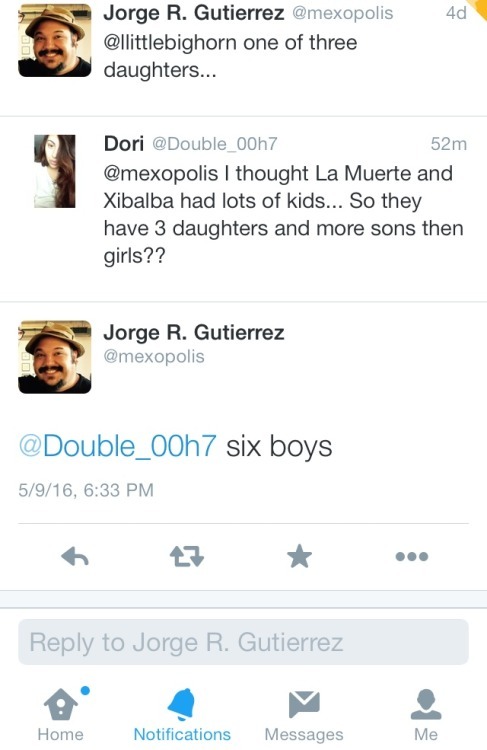 Xibalba is La Muerte's husband. They have a complicated relationship due to their different beliefs and the completely different, opposite antagonistic kingdoms, lands and realms they rule. La Muerte believes that humankind is completely good, true and pure. On the other hand, Xibalba thinks and believes that humankind is selfish, greedy, sinful, concerned only in its own interest. Despite their differences and occasional conflicts, La Muerte and Xibalba complement each other very well, and can’t live without each other. La Muerte knows Xibalba well enough to know that he is not completely evil, so seeing him act in a petty and selfish way saddens her and disappoints her. But when he is able to put his pride aside and show genuine repentance for hurting her, she is more than willing to forgive him . It is known that the two are good friends, although they have not seen that they interact much on screen. La Muerte is happy to see him when he appears in the Land of the Forgotten with Manolo and his family. Near the end, when Candle Maker embraces both La Muerte and Xibalba, although she is surprised at first then she smiles at him amiably. She is the twin sister of La Muerte . The only thing that is known about their relationship so far is that they are "rivals in everything" . 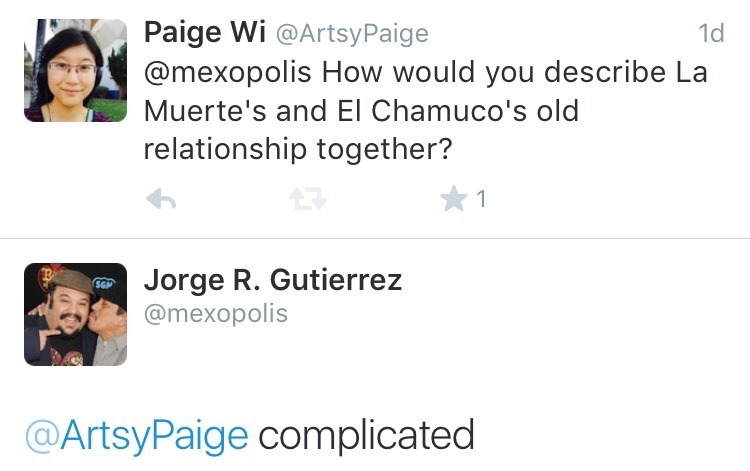 He is La Muerte's old flame, but he was more of a love interest than a boyfriend ; due to their "complicated" relationship . He is currently married to her sister La Noche, but it is known that he still has feelings for La Muerte , something that she suspect it . Her body is made out of sweet sugar candy and her dress is made of Cherry fruit roll up . La Muerte and Xibalba had many bets in between the time Manolo Sánchez, Maria Posada and Joaquín Mondragon were children, until they were grown up. They mostly tied . La Muerte used to crush on and date mortals before she met Xibalba . La Muerte and Xibalba met on earth at a party where both were pretending to be human . La Muerte's necklace was a gift from Xibalba when they first met . And the accessory is a locket . The candles on La Muerte's dress and sombrero are humans' lives that mean something to her . La Muerte inherited the Land of the Remembered from her mother . La Muerte has a close resemblance to "Santa Muerte" a Mexican Goddess that bring people a swift and just death and prevents violent and unworthy demise. The candles atop of her sombrero might be an indicator of her emotions as shown in the part where she shouted in fury when she realized Xibalba cheated once more and the flames of the candles enlarged and thus lighting the whole dark place of the Land of the Forgotten. La Muerte is said to be a few centuries younger than her husband, Xibalba. 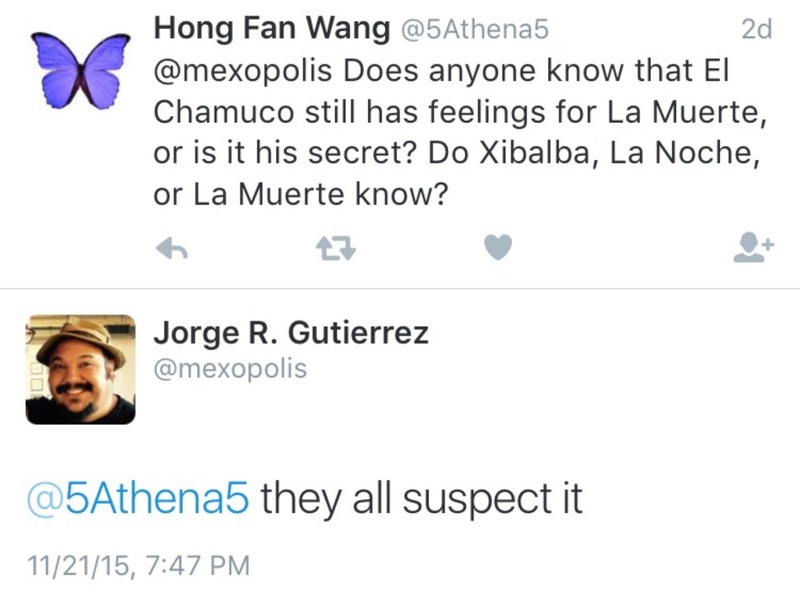 La Muerte had won a different wager before with Xibalba, though it wasn't fully depicted. Xibalba had another nickname besides "Mi Amor" for La Muerte: Muertita . In a concept art, originally La Muerte had with her a green snake that was part of Xibalba (like Más y Menos) . 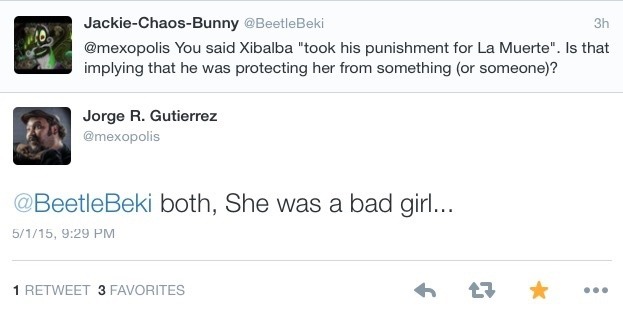 Xibalba took a punishment for La Muerte, which made her devastated . She was the one who was meant to be punished because she did something bad  . A quote from The Art of the Book of Life: “Her dress is red because it represents love, passion, and life. The only blue in her design is in her eyes, because she only has eyes for Xibalba" . La Muerte and her green snake.